Lt. Grimes was killed in action on 11th February 1846, at the Battle of Sabraon – the last battle of the First Sikh War. Following his fatal injury, it is believed that the jacket was removed by cutting it along the centre-back seam. 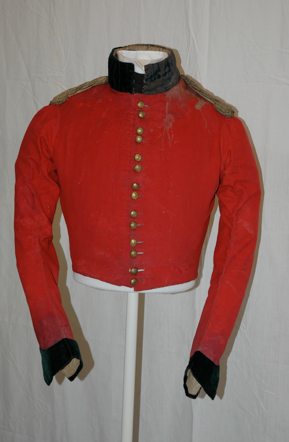 The jacket was returned to England together with other objects belonging to Lt. Grimes.For many years, the military jacket had been stored flat in an archive box and at some time in its’ history, been affected by moth larvae infestation. 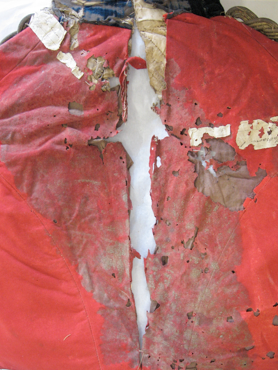 Extensive conservation was needed in order that the jacket could be safely displayed. 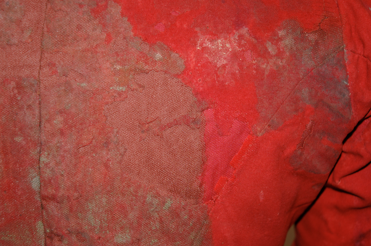 The jacket was surface cleaned to remove loose particulate soiling. Despite the fact, that on the back, the red wool fabric is impregnated with heavy staining, further cleaning was not considered appropriate. 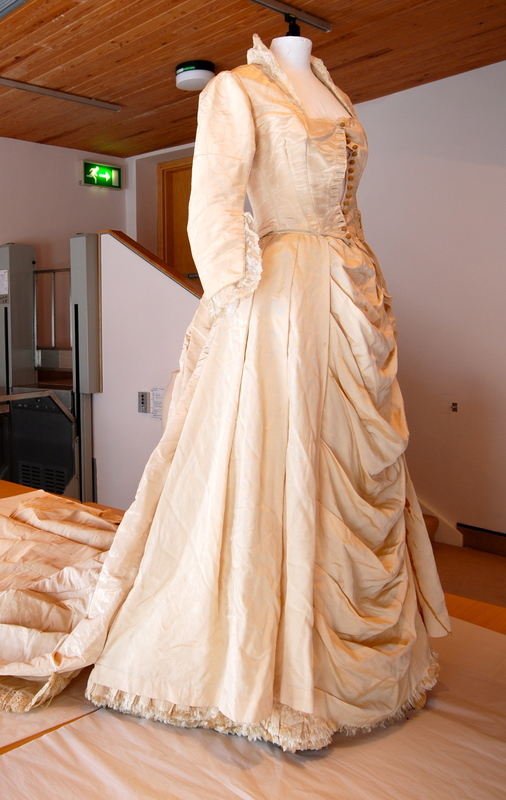 Stitched support was carried out to enable the jacket to be displayed as an item of military costume. 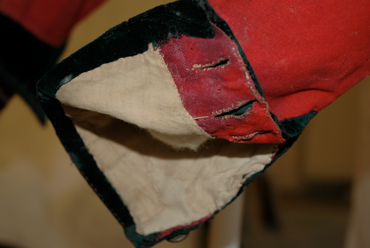 The centre-back was repaired: both back sections were encased between appropriately dyed support fabric and conservation-grade net. Stitching was worked around holes and splits, as the stained wool was too brittle to be stitched. 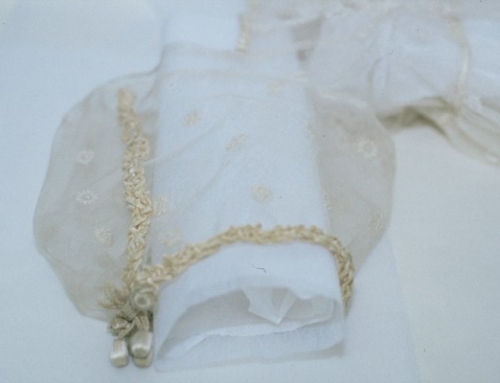 A stitched patch support technique was used to consolidate other areas, including the collar and cuff that were damaged by moth larvae infestation. 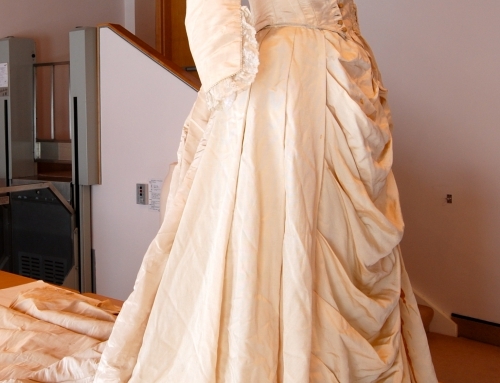 A display mannequin was prepared to support the jacket. 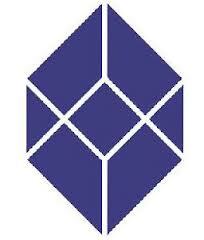 Documentation of the jacket enabled detailed information to be gathered and recorded. 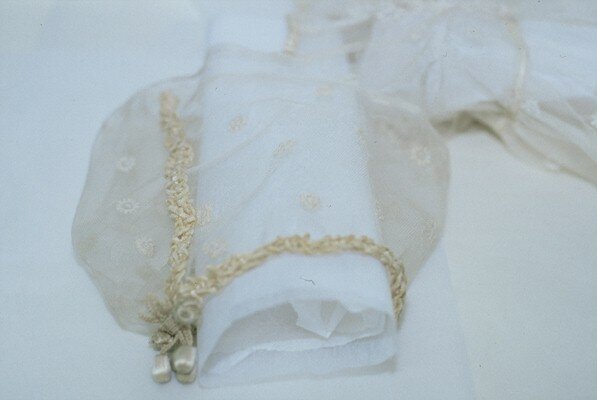 For example, at the top of the jacket, under the cotton lining, remains of a padded lining was discovered.